MISSION: Our Mission is to find and aid people in distress and to assist law enforcement agencies with evidence searches. Missing persons search in wilderness and urban settings. Assisting with the location of drowning victims. Locating articles of evidence at a crime scene. Locating victims in rubble in case of fire or natural disasters. Locating victims after an avalanche. KCSD is part of the King County Search and Rescue Association and depending on the objectives of the mission, we work closely with the other KSARA units: Seattle Mountain Rescue, Ski Patrol Rescue Team, Pacific Northwest Trackers, Explorer Search and Rescue, 4×4 Search and rescue, Northwest Horseback SAR and the King County Incident Support Team. In addition to the specialized skills training required by each discipline, the members of all the units undergo a rigorous, standardized core competency training program developed by the Washington State SAR Coordinators Association. This assures that KCSARA units can function effectively with each other and with other search and rescue teams from around the State. We enjoy what we do and welcome you to learn more by browsing our website to discover more details on the different search disciplines (airscent, trailing and specialty search) as well to find out more about KCSD and its members. We also hope you will visit the YOU can help section to learn how to stay safe in the wilderness and what you can do to help our mission. How dogs use scent to find us? Research suggests we all produce a unique set of smells as we breathe, sweat and shed skin cells (up to 40,000 per minute). We all leave behind an olfactory cloud of chemicals, debris and the microbial biome that inhabits our skin as we walk. Our genetics and lifestyle both contribute to our unique olfactory footprint such that dogs can even distinguish between identical twins! Trailing dogs discriminate between people based on our unique chemical signatures; combinations of volatile chemicals we emit and microbial breakdown of the cells we shed. 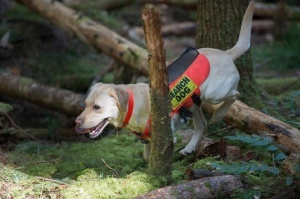 Airscent and avalanche dogs use the same process but are taught to search for the common ‘human’ smells rather than a subject’s unique smell. Almost 1/8 of a dog's brain and over half of its internal nose is committed to smelling. Humans, on the other hand, only have about a square inch of their internal nose dedicated to the sense of smell. While the degree varies between breeds and the individual dog, it is thought that the dog's ability to smell is between 10x-100x greater than man's ability to smell!